Some modern writers have associated Simon with the name the' Zealot . as a basis for recognising him. 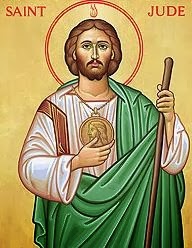 Jude is often, in popular usage, known as the patron of desperate causes- the "saint of last resort"
Summary of Ss Simon and Jude, Apostles. Simon “the Less” is also called “the Canaanite” and “the Zealot.” Jude “(son) of James” (Luke 6:16; Acts 1:13) was traditionally identified as Jude, brother of James and author of the letter of Jude, but may also be the one called “Thaddeus” (Matthew 10:3; Mark 3:18). 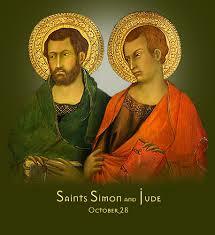 A tradition has Simon and Jude preaching and being martyred in Persia. Honoured among the twelve apostles, the first followers of Christ. Saints Simon and Jude went together as missionaries to Persia, and were martyred there, according to St Venantius Fortunatus, a poet and bishop of Poitiers in the sixth century. This may explain why so little is known about them and also why they are usually put together. Patrick Duffy summarises traditions about them. In the various New Testament lists of the twelve apostles (Mt 10:2-4; Mk 3:16-19; Lk 6:14-16; Acts 1:13), the tenth and eleventh places are occupied by Simon the Zealot (also called Simon the “Cananean,” the Aramaic word meaning “Zealot”) and by Judas of James, also called Thaddaeus or Lebbaeus. Jude is often, in popular usage, known as the patron of desperate causes, the “saint of last resort”, the one you ask for help when all else fails. We may wonder what this is about. Except on these lists above, Simon is not mentioned by name elsewhere in the New Testament. Some modern writers have used his surname “the Zealot” as a basis for conjectures associating him, and through him perhaps even Jesus, and his original followers, with the Zealot movement described by Josephus, a Jewish independence movement with a somewhat terrorist streak. Jesus chose some unlikely people: a former Zealot, a former (crooked) tax collector, an impetuous fisherman, two “sons of thunder” and a man named Judas Iscariot, who was to betray him. It shows that holiness does not depend on human merit, but is entirely God’s creation and gift.